What a cool art sculpture! I'd love to try to photograph it from every angle. Really neat...where was that taken? Great piece of art - makes you think, as good art should. That is interesting. Beautiful picture. How tall is that artwork? It looks huge! What a cool sculpture. Definitely "Swiss People" like what Katya said. What a unique sculpture! Happy WW! 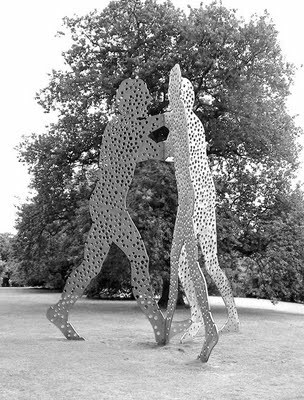 Yorkshire sculpture park is a wonderful place for a walk. And it's free. Can't be bad..
Hmmmmm....."Swiss People"? (as in cheese!?) What an interesting sculpture! beautiful--wonder how they made all those holes?